One of the most useful program features is the ability to monitor computers and track changes in their hardware and software with notifications sent to the administrator. You can find out what new software was installed, whether it was authorized or not (blacklisted). If a memory module disappears or goes down, you will know about this and about all other activity on your computers. 1. Click "Service and Settings" - "Inventory Log". 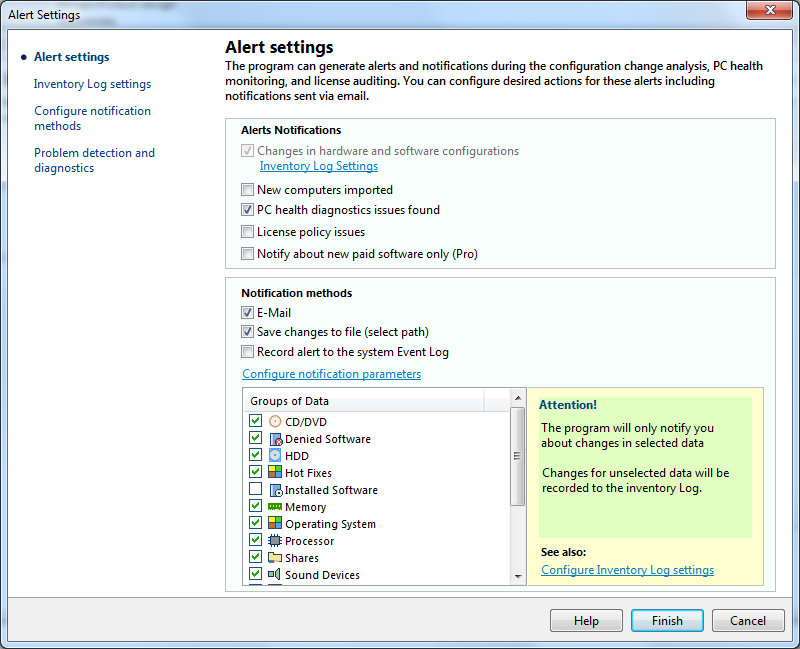 Click the "Configure Alerts" button and select events for alerting. 2. Go to the "Configure notification methods" tab, configure the email sending parameters, and test the mail server connection. 3. Configure detailed parameters for tracking on the "Inventory Log settings" tab. Click "Service and Settings" - "Inventory Log". Click the "Configure Alerts" button and go to "Inventory Log settings" tab. 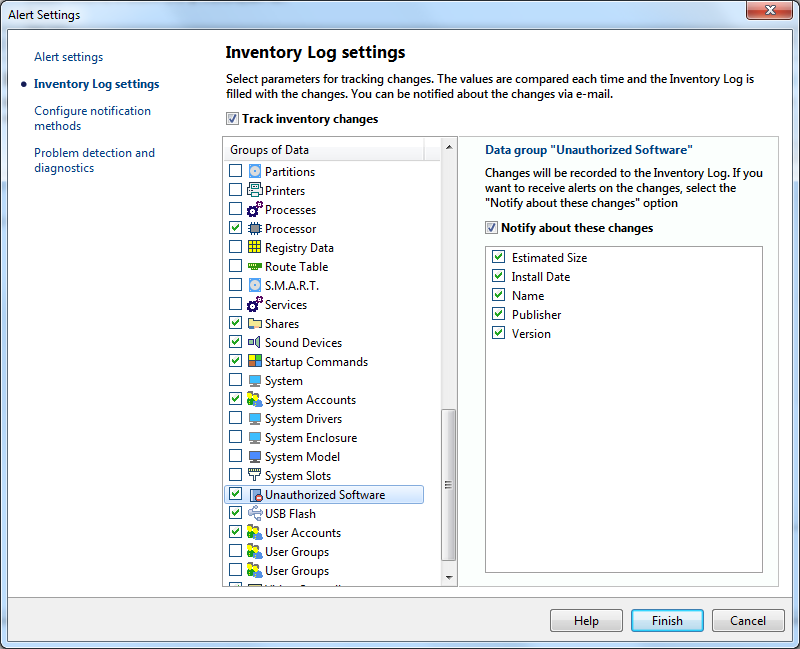 The "Track inventory changes" option enables and disables the inventory monitoring and tracking. It is enabled by default. Monitored groups of data can be selected in the list below. Select necessary groups of data to monitor them for changes. Disable unnecessary groups of data to reduce the CPU load during the data analysis and prevent the inventory log trashing. Important: By default, the program writes changes to the inventory Log only. It is up to you to configure recording to the Event Log or sending emails to your mailbox for changes of some very important parameters. The program can send notifications to you when it finds some inportant changes in software or hardware. It is up to you to configure what data is "important" and the program should generate an alert when it is changed. 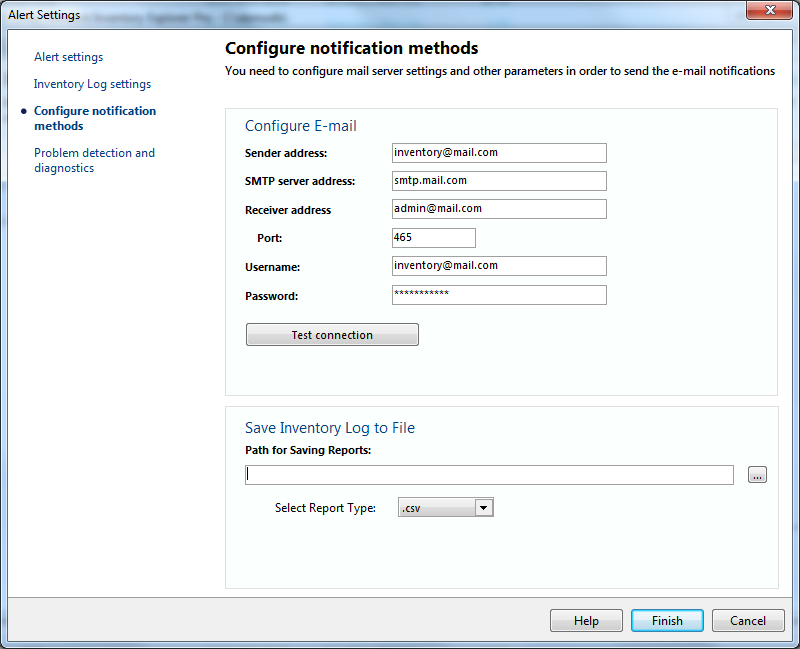 The notification methods include: 1) emails, 2) saving reports in a folder, 3) recording to the system Event Log. In order to receive notifications on important changes, you need to enable the "Notify about these changes" option for every selected data group. If this option is disabled for some data, you will not receive any notification when it changes. By default, some data groups are selected. If you do not wish to receive notifications about these groups, disable the "Notify about these changes" option for them. After that, the program will only record changes to its internal Inventory Log. To display this log on the screen, please click "Service and Settings" - "Inventory Log". Learn more about the Inventory Log. The data should be collected repeatedly from computers so the program could analyze configurations and detect changes. You can poll computers manually (using the "Collect data from computers" button) or configure scheduled tasks for the automatic background monitoring ("Service" - "Settings" - tab "Scheduler"). 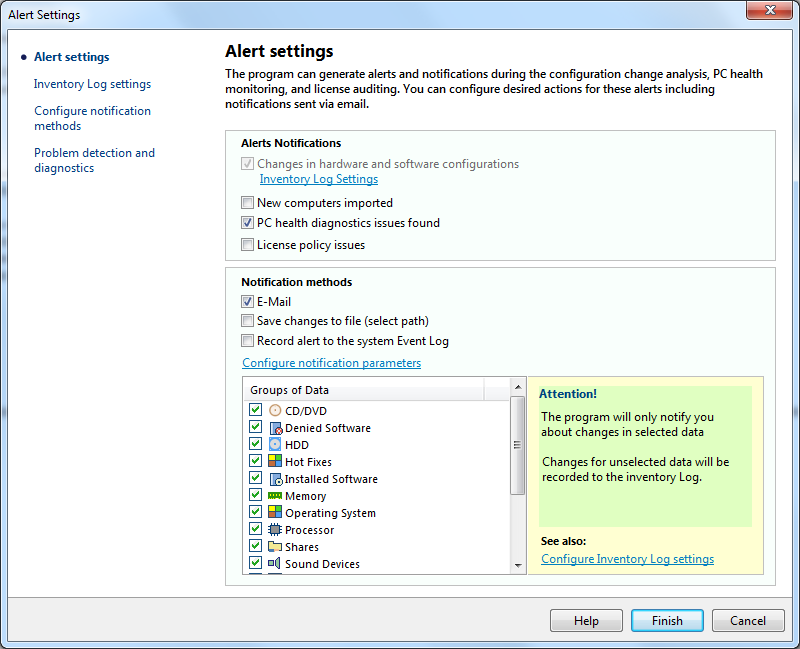 The program can throw alerts when problems are detected on monitored user computers. For example, low disk space is detected, OS updating is disabled, antivirus program is missing or outdated, HDD is overheating, etc. Click "Service and Settings" - "Inventory Log". Click the "Configure Alerts" button and go to "Problem Detection and Diagnostics" tab and enable necessary options for the diagnostic notifications.